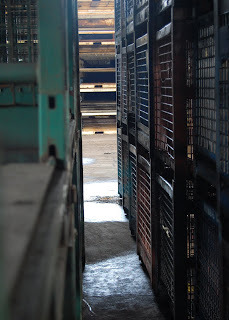 This warehouse was once stuffed with parts bins for Chrysler. Service tags on the original electrical equipment date the building to December 1949. It's located along to a rail spur that previously ran south to Chrysler's Windsor Assembly plant, the largest employer in the city. GM's Windsor Transmission plant is adjacent to this lot, and is permanently closing this year.